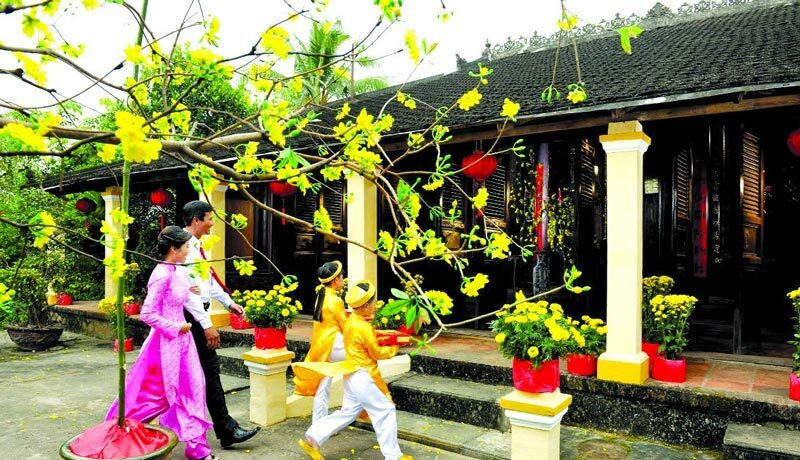 Tết Nguyên Đán or simply Tet (Vietnamese Lunar New Year) is the most festive time of year in� Vietnam as well as the busiest due to the amount of preparation required. You can easily get a sense Tet’s intense yet joyful atmosphere just by watching streets crowded with a continuous stream of people busy with� shopping and preparing in advance for Tet. On this special occasion, everything must be prepared carefully and early. To get ready for the holiday in accordance with Vietnamese belief, you should clean your home, replace your outdated things with new ones and—because you’re to stop all work during Tet including household work—cook all the food you’ll eat during the holiday. 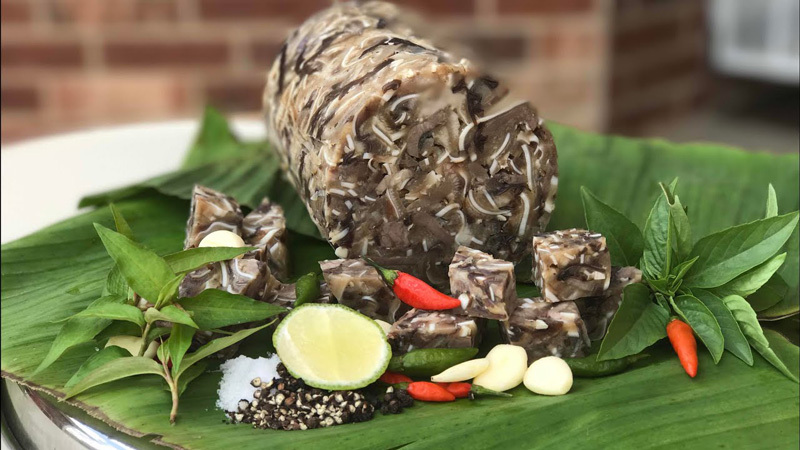 There are certain dishes like� bánh chưng� (square meat cake) that are like unofficial Tet mascots for their close association with the holiday. 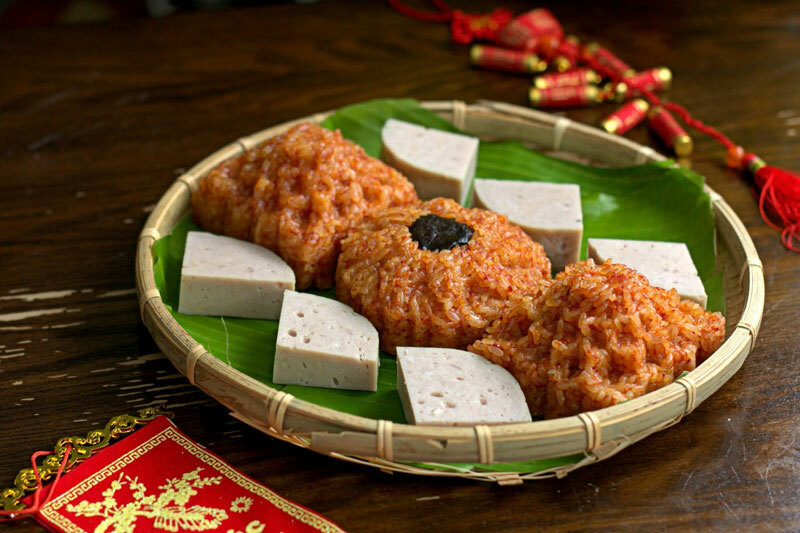 If you’re in Hanoi or somewhere else in the North, expect to see typical dishes from that region there like� xôi gấc (sticky rice) during this time of year. In this series, we’re going to explore the food traditions of Vietnam’s three major regions—the North, Middle, and South—going from top to bottom. The Vietnamese call this time of year� Tết Nguyên Đán or� Tết Ta (Vietnamese New Year),� Tết Âm Lịch (Lunar New Year),� Tết Cổ Truyền (Traditional New Year). As the Lunar New Year is determined according to the phases of the Moon so Tet is celebrated later than� Tết Dương Lịch� (Western New Year). It has many different names, but we’ll just call it “Tet” here for short. There is an additional month added to the lunar calendar every three years, but otherwise, the Tet window remains unchanged: the first day of the Lunar New Year is never before January 21 and never after February 19 in the Gregorian calendar. It is usually held during late January to the middle of February. In the past, the entire annual Lunar New Year celebration used to last for about 2 weeks across two separate periods: seven or eight days of the old year and 7 days of the new year (23 December to the end of January 7). 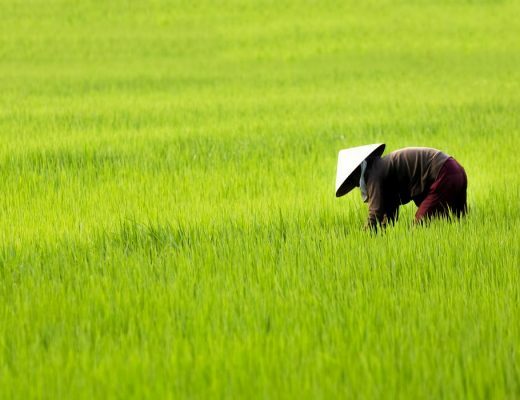 Just like other Asian countries deeply influenced by Chinese culture, Tet holds a very� important, significant meaning in the life of the Vietnamese people for many reasons. For one, it’s an opportunity for a family reunion. It’s often the occasion to welcome family members returning home after working apart all year round. Second, it’s also an opportunity to visit acquaintances, relatives, and friends during the longest leisure time period of the year. If you asked me which of Tet’s many activities is the most fascinating, I would doubtlessly pick preparing the traditional food. Tet foods play a vital role in worshipping the ancestors, reuniting the family and receiving the guests during the first three days of the Lunar New Year. Preparing for these dishes requires one to be meticulous and attentive to the particular traditions of your area. As Vietnamese people are creative in the kitchen, the selection of Tet’s food is rich and diverse varying from region to region. My grandma and mom always bought and prepared loads of� food in the week before Tet’s arrival because food plays such a large part in� Tet celebration. 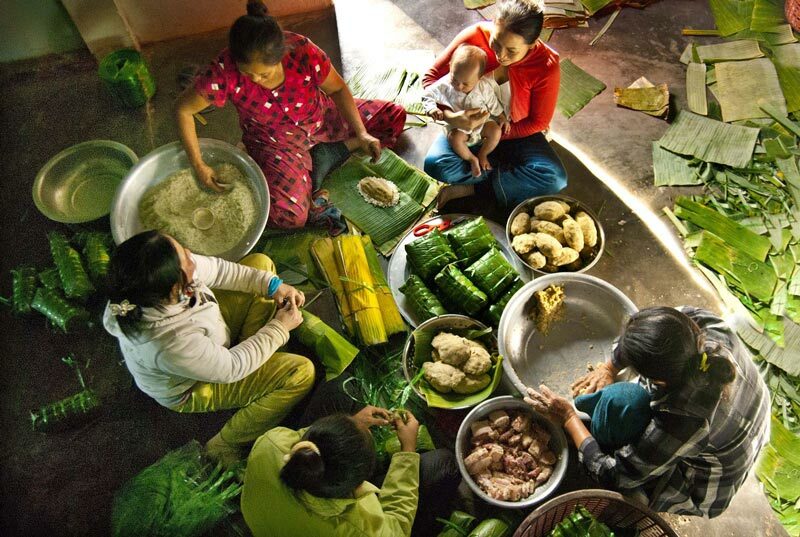 Vietnamese people always make sure that there is plenty of food for the whole family to last for at least three days since it is taboo to work or cook during the first three days of Tet. It is also bad luck to run out of food during this time. Let me show you what might be on the typical plate of a� Northern Vietnamese family during� this coming Tet. 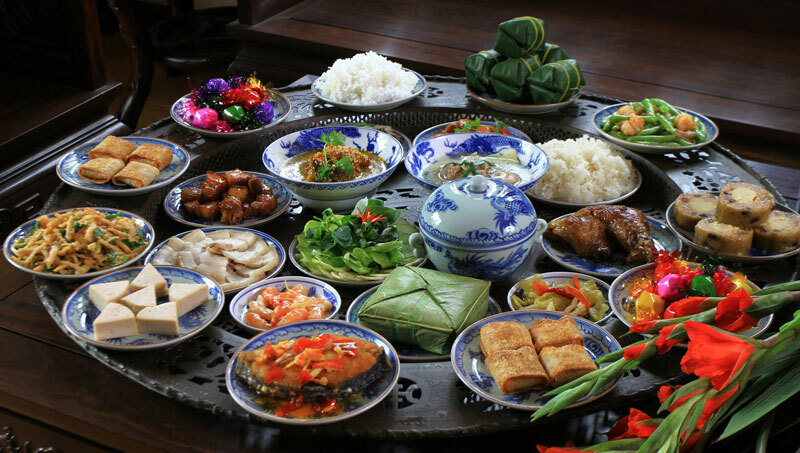 A complete Northern Tet meal is considered the most traditional meal of all.� Hanoi is said to have retained the highest number of traditional dishes among all the other the northern provinces. A complete meal there calls for preparing a broad number of foods and a sophisticated presentation. Traditionally, the complete Northern Tet meal needs eight dishes—four bowls and four plates—which represent four pillars, four seasons and four directions. The traditional Hanoian family’s meal has been simplified now compared to the number of recipes in� the past. Nevertheless, there are still some irreplaceable dishes that almost every Northern family will prepare for this special occasion. This is the most well-known cake of the holiday, arguably the most famous Tet dish of them all.� Bánh chưng (Vietnamese square cake) is made from glutinous rice, mung beans, pork and other ingredients, which are believed to express the essence of the heaven and the earth through the skillful hands of humans, according to Vietnam’s legendary ancient chief� King Hùng Vương. By this belief, making� bánh� chưng� cake is also the ideal way to express gratitude to our ancestors and homeland. It embodies the spirit of the Vietnamese Lunar New Year. Vietnamese families love to pack and boil� bánh chưng cake together as a household around one week before� giao thừa (New Year’s Eve). It is also a great chance for family members to gather and spend the night together sharing neverending stories, games and conversations while waiting for the cakes to be boiled. My family used to pack and boil� bánh chưng years ago in a private corner right in front of our house. This is doubtlessly a precious memory to any kid growing up in the city like me. Because the making of the� bánh� chưng cake requires the participation of all family members, each of us was involved in different parts of the process, but we shared a common joy. Early in the morning, we had to head out to market to choose� lá dong (phrynium leaves). To make the cake, you must cleanse them over water, then carefully wipe up every single leaf. If you leave the leaf wet, it might ruin the whole cake. 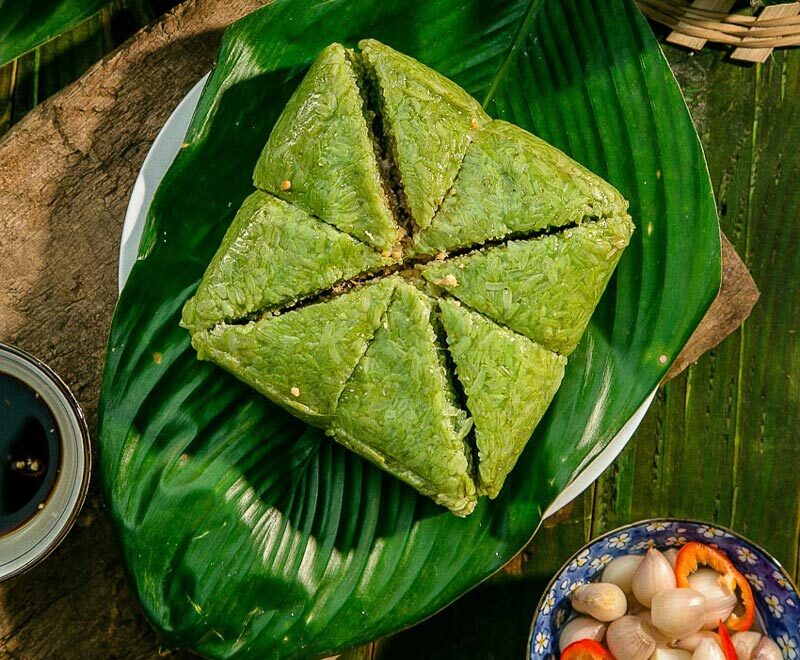 Packing the cake is even more challenging.� Bánh Chưng cake should be tightly and carefully wrapped, boiled for about 14 hours, taken out, soaked in water and squeezed using a heavy plank. That way, when� bánh chưng cake is cut, it will be limber but not flabby. It will instead be fleshy and fragrant. Nowadays, times have changed and it is hard to find a family who packs and boils� bánh chưng� cake by themselves in the city, but family elders still get first dibs and choose before anyone else so they get the one that’s best cooked. The cake should be made from a fragrant glutinous rice for better longevity. Xôi (Sticky rice) is also an indispensable part of the traditional Northern meal. 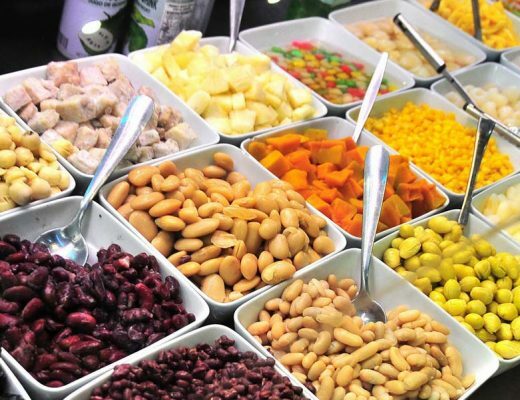 There’s a selection of different� xôi:� xôi lạc (sticky rice with peanuts),� xôi đậu xanh (sticky rice with mung bean), and my personal favorite� xôi gấc (sticky rice with special� gấc fruit). 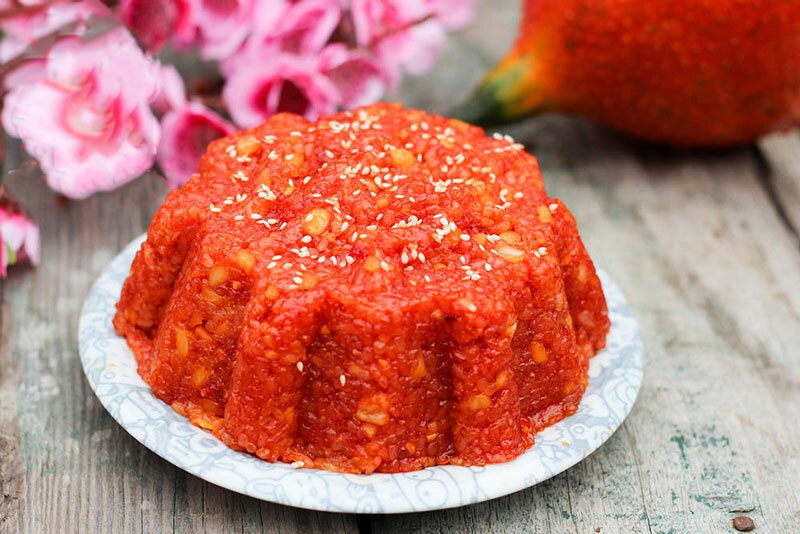 Among these types,� xôi gấc is, in my opinion, the best choice thanks to its distinct red color, which signifies a good fortune, according to Vietnamese belief. 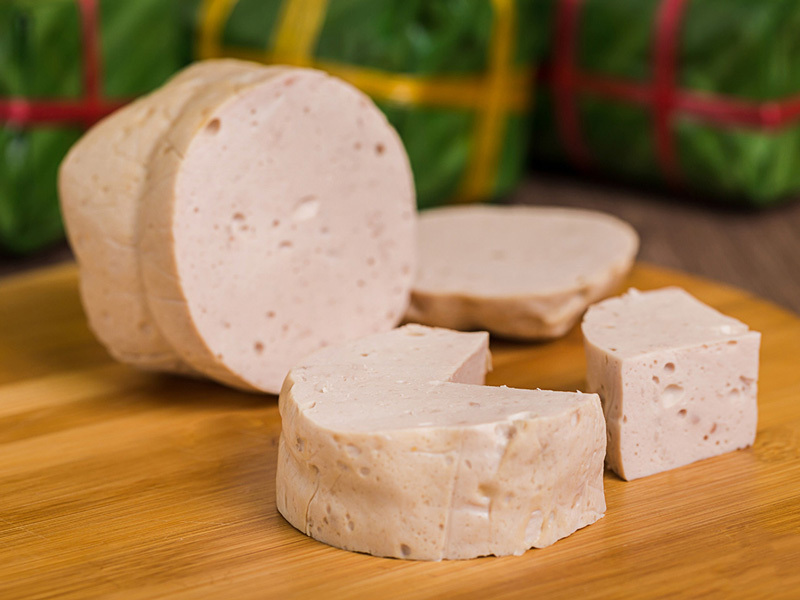 Generally,� xôi gấc is usually served with� giò chả (Vietnamese sausage) or boiled chicken in Tet meals. Sometimes it can be served with� chè (sweet soup) like a dessert dish.� Xôi gấc is a great start for the new year because this dish is believed to bring lots of luck and symbolise good things. 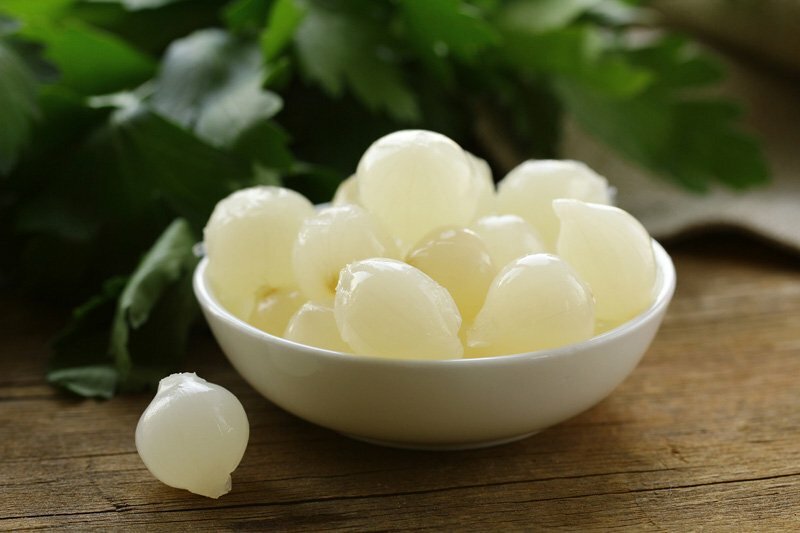 Fresh� pickled onions are often served as a side dish alongside� bánh� chưng cake or high protein dishes to reduce the greasiness. Foreigners may find this dish, in a word, unfriendly as they often can not handle the alliaceous, intensely oniony smell. But once you get along with these sweet-but-sour, slightly spicy pickled onions, you just can’t resist them. It helps elevate the flavor of Tet dishes as well as benefit our body’s digestive processes. First thing’s first: in order to make standard pickled onions, you need to choose old onions with firm bulbs. Next, soak the onions in water mixed with borax and ash for two days and two nights. After that, take out the onions, cut off the roots, peel them, then put them into a large jar, cover them with salt and then put a thin layer of chopped cane on top. Cover the onions with layers of bamboo. After two weeks, you can get the onion bulbs out, soak them in sugar and vinegar. In three days, your pickled onions will be ready to rock. Regardless of regional geography, Vietnamese Tet feast must contains a dish of� giò(Vietnamese sausage), one of the most savoury of all Lunar New Year dishes. Vietnamese sausage (Giò), usually made of pork, from meat finely milled in a stone mortar and wrapped in banana leaves to form a tube shape. It is then boiled or steamed. There’s also� giò bò (beef sausage), which is made from finely milled beef, a specialty of central Vietnam. A well-cut piece of� giò must look neat, nice, and easy to pick up. The plating and presentation of this dish depends on the creativity of cooks. Then you have� giò thủ (pork head ham), a Vietnamese sausage made from the meat of a pig’s head. For making� giò thủ, pig’s ears and head meat are not milled but diced, and mixed with other ingredients like wood ear (black mushroom), fish sauce, pepper and garlic, all of which are stir fried. They are first fried in a pan, and then stirred well on low heat. Then, wrap the pies in fresh banana leaves, tie them carefully, and boil or steam them just like how we did with� giò chả. A well cooked giò thủ dish gets it marble texture with the crunchy cartilage in every bite. This chewy, meaty, crunchy dish endowed with a deep, spicy, strong favour of condiments and garlic is best paired with pickled onions and a cold glass of� bia hơi (Vietnamese fresh beer). 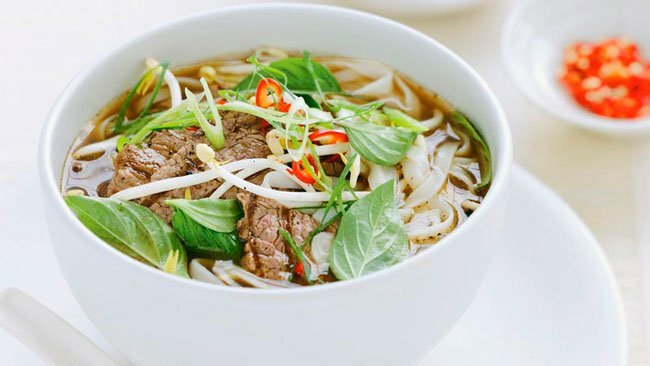 Thịt đông is a dish particular to the winter-spring period of the Northern Vietnam, when the outside temperature is drastically cooler.� Thịt đông is made from mixed protein, sometimes from chicken as well as pork and pork skin. After the ingredients are cooked in a pot, they may be left to cool down inside the pot, or divided into small bowls, depending on your preferred serving size. Then it is covered and chilled in the open air to make what you’d agree is one wonderful dish. 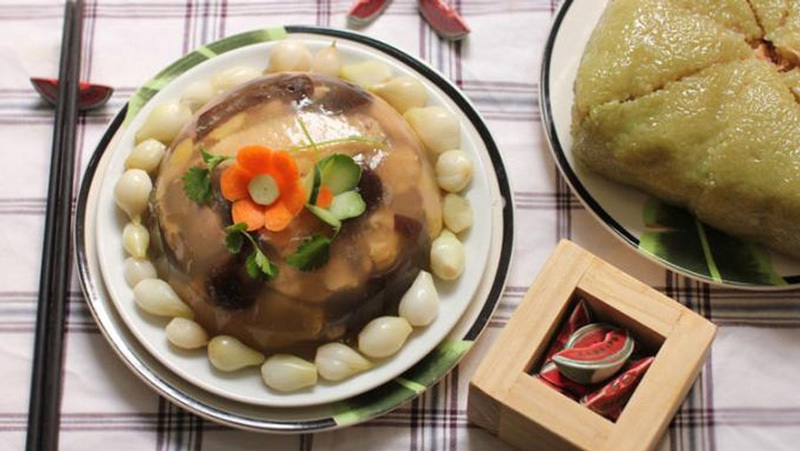 The complete� thịt đông dish has a thin white layer of fat on top and the smooth jelly-like layer of frozen meat underneath. A piece of frozen meat served with pickled onions and a hot bowl of rice makes the true Northern Tet flavor. Frozen meat is typically served with a hot, fragrant bowl of rice as the heat of well-cooked rice melts down the frozen fat and soup. All harmonize into one perfect taste.